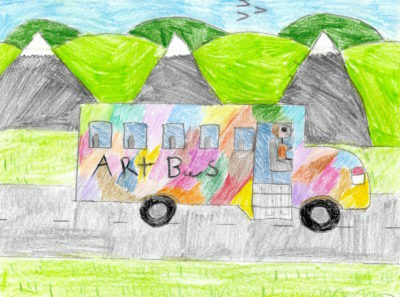 As a non-profit organization, the Arts Bus Project depends mostly upon grants, Town appropriations and private donations to fund its programming. In its pilot year (2010), the Bus made 79 stops during the months of May through September, and served more than 1900 toddlers, children and young adults in the communities of Bethel, Braintree, Brookfield and Randolph. In its second season, the Bus added the towns of Chelsea, Tunbridge and Williamstown to its regular schedule, made 134 stops and served over 2,100 individuals. In our third year the Bus made 103 stops, and again over 2,100 children and adults enjoyed our programming. As the word spreads, more requests for the Bus to appear just keep coming.